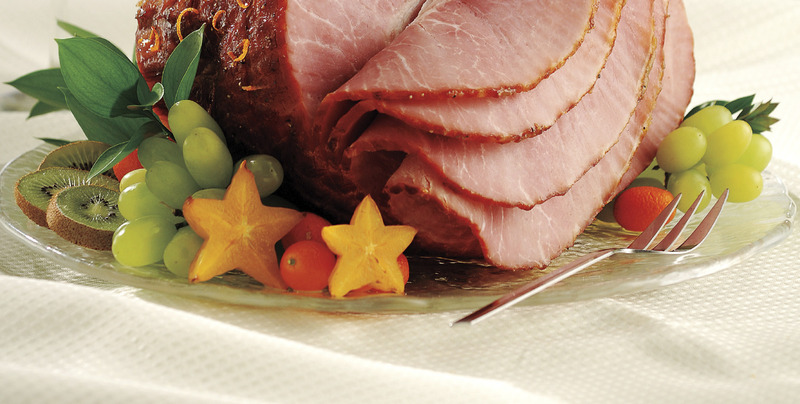 This spiced orange-glazed ham from Schnucks is sure to be a crowd pleaser. Preheat oven to 325°F. Remove ham from packaging, discarding plastic cover from bone-end of ham. Reserve glaze packet for another use (see below). Place ham, cut side down, in 13 x 9-inch metal, glass or ceramic baking pan; cover loosely with aluminum foil. Bake 1 hour. Meanwhile, grate peel and squeeze juice from orange; place juice and 1 tablespoon peel into 1- to 2-quart saucepan. (If desired, set aside any remaining peel to use later for garnish.) Add marmalade, Dijon mustard, vinegar, pumpkin pie spice and dry mustard and heat to boiling over medium heat; boil 2 minutes, stirring occasionally. Add brown sugar and boil 2 minutes longer, stirring occasionally. Remove saucepan from heat. Makes about 2 cups glaze. Remove ham from oven; set aside aluminum foil to use later. Spoon some glaze over ham, then return ham to oven. Bake 45 to 55 minutes longer or until internal temperature reaches 120°F, brushing ham every 15 minutes with additional glaze. Remove ham from oven. Carefully place ham on serving platter. If desired, sprinkle any remaining grated orange peel over ham for garnish. Cover ham loosely with reserved foil and let stand 15 minutes before serving. Internal temperature will rise to 140°F upon standing. Meanwhile, pour any drippings from 13 x 9-inch pan into same saucepan with remaining glaze; heat to boiling over medium-high heat. Boil 10 to 12 minutes or until sauce is thickened and reduced to about 1-1/2 cups. Slice ham and serve with sauce. Sprinkle dry glaze directly over boneless, skinless chicken breasts or salmon steaks before sautéing in a touch of oil or butter. In a large nonstick skillet, heat 2 tablespoons dry glaze and 1 tablespoon each water and butter over medium to medium-high heat until glaze dissolves; add 1 pound peeled and sliced apples and cook until tender, browned and glazed. In a small saucepan, heat 1/2 cup dry glaze with 2 tablespoons water and 1 tablespoon butter until glaze dissolves. Cut about 1-1/2 pounds peeled sweet potatoes into wedges or chunks. On a foil-lined rimmed baking pan, toss potatoes with glaze to coat. Roast in a 425°F oven 40 to 45 minutes or until tender, stirring once halfway through roasting. This grilling season, make your veggies the star.